In this episode we talked about the latest updates to PLM, including options to select both include and not include Mailers when filtering. Plus, we discussed items currently in development and answer members questions. In this episode we talked about the latest updates to PLM, including the ability to delete a mailer made by mistake. Plus, we discussed items currently in development and answer members questions. In this episode we talked about the latest updates to PLM, including the ability to delete an import made by mistake. Plus, we discussed items currently in development and answer members questions. In this episode we talked about the latest updates to PLM, including the ability the performance updates to the address validation processing. Plus, we discussed items currently in development and answer members questions. 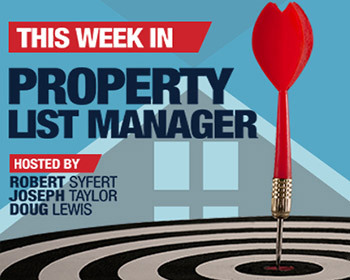 There were no updates to Property List Manager this week, so the entire show was an open Q & A with discussions on future road map possibilities. Query Builder is here!! In this webinar we take you through all the details on the new filtering options along with an open Q & A and discussions on future roadmap possibilities. In this episode we talked about the latest updates to PLM, including the addition of parent/child list capabilities and the ability to now merge lists. Plus, we discussed items currently in development and answer members questions.